For each serving, spoon 1/3 cup yogurt into dessert dish or parfait glass. Add 1/2 cup cereal. 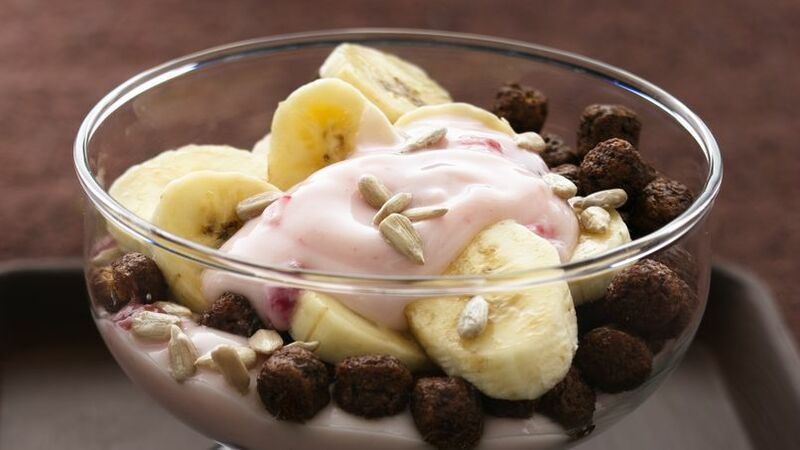 Top each with 1 tablespoon of the sunflower nuts, 1/4 of the banana slices and 1/4 of remaining yogurt. Sprinkle with remaining sunflower nuts. Top each with strawberry. Use plastic cups and spoons for a "to go" treat. Next time, try raspberry or peach yogurt and use sliced or slivered almonds instead of the sunflower seeds. Here's a layered breakfast treat that combines sweet, smooth and crunchy in every bite!